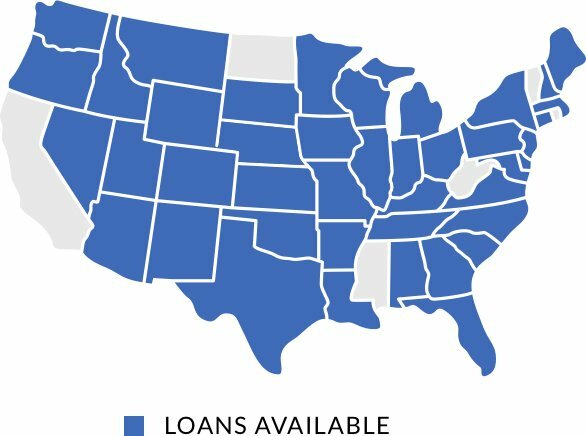 After a loan closes, see below for how our loan process works. Forms do vary by state; contact us for specific forms. After a loan is approved, the loan amount is set. Total costs minus the loan amount is what we call the “equity”. The borrower fulfills this equity need first. Then we fund 100% of the remaining costs according to an approved budget. The land can cover the equity requirement (see Land Financing). Scenario A, Land is a large component of total cost: The loan may cover up to 60% of the land cost plus 100% of other approved expenses. Scenario B, Land is a small component of total cost: You may need to cover the land cost plus certain initial costs. Scenario C, Land is being financing by third-party (land seller or other): The loan may be able to cover 100% of costs. 1 Submit a draw request. 2 We fund it then we inspect to confirm completion. We inspect first and then fund if: (a) the request is for $50,000 or more, (b) if the loan went out-of-balance (a prior draw was overfunded) and/or (c) if it is the final draw. Fee: We will do 5 draws for FREE on every loan—we will cover 100% of inspection and fulfillment costs! Lien Waivers: Required for line items that are $7,000 or higher. High LTV Loans: If a loan is 70% LTV or higher, we reserve the right to fund the 5 largest budget line items directly to the trades, suppliers, and/or to the general contractor. If a loan is 74% LTV or higher, we reserve the right to fund any or all budget items directly to the trades, suppliers, and/or to the general contractor. Final Draw: To fund the final draw, we require the certificate of occupancy or completion. With each draw request the GC will provide a General Contractor Consent and Acknowledgement. So long as GC fees are included as part of the approved budget, we will fund GC fees as follows: first half at 50% completion and the second half upon full completion.